Life in Japan can be measured in seasonal dessert offerings. With Valentine’s Day now in the past, the focus falls squarely on one of the year’s spotlight stretches. Cherry blossom season approaches, with companies big and small prepping an array of sakura-tinged foodstuffs for the pink-loving masses. 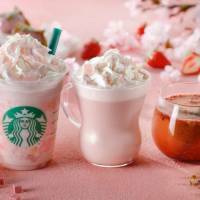 Starbucks Japan beat everybody to the punch with its line of “Sakura Strawberry” drinks and foods. 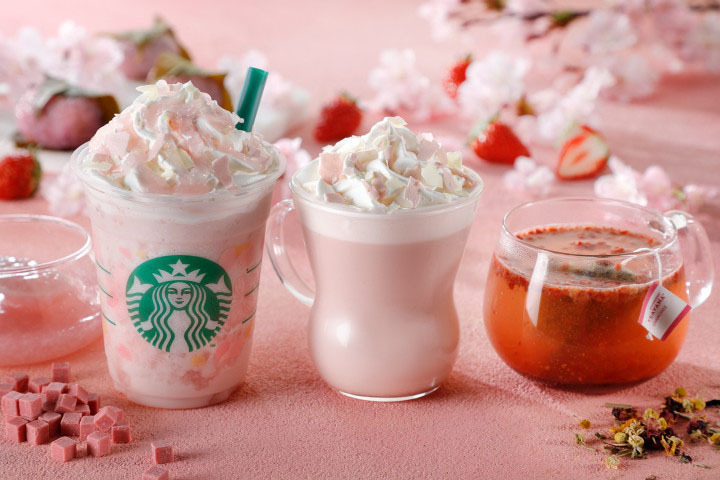 It has unveiled three drinks — a Sakura Strawberry Pink Mochi Frappuccino (¥580 for a tall), Sakura Strawberry Pink Milk Latte (¥470 for a tall) and Sakura Strawberry Pink Tea (¥470 for a tall). Alongside these, they have sakura-flavored donuts, cakes and a range of merchandise. I want to get the Pink Mochi Frappuccino, but every location near me is sold out. The latte it is then! The hot version features a pleasant but not overwhelming strawberry flavor, giving it a nice, strawberry-milk taste. But the sakura flavor is harder to pin down until you reach the bottom of the cup and find all of the petal-shaped pink and white chocolate gathered there. That last gulp is a little too sweet, but everything before makes spring feel delightfully close.